Inside The Mind Of A Chicken! 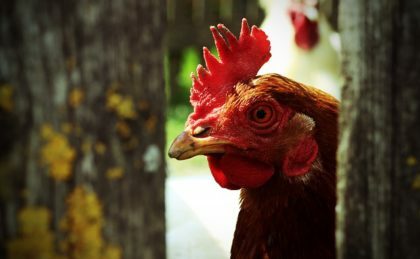 As we have said many times before, we at the typesofchicken.com team strive to help our readers understand how chicken keeping works, and how to make your life as a chicken keeper better. For today`s article we decided to try and explain to our readers how the mind of a chicken works with hope that our readers will manage to better understand the behavior and thinking patterns of his chickens which can make his life as a chicken keeper easier. With all of this said it is time for us to take you inside the mind of a chicken. You might not know this but the brain of your chicken is similar to the human brain in some ways. For example, the brain wiring that controls the memories and the problem solving is very much similar to ours. Chickens also have a left brain which allows them to multitask. 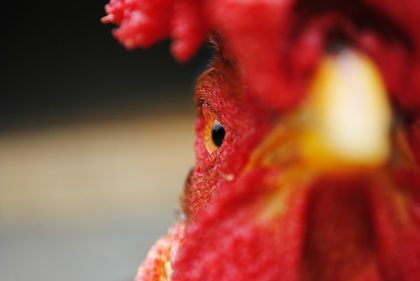 Chickens have two highly specialized fields of vision that allow them to see a wider area or focus or zoom in on a specified area. We have also mentioned before that chickens can see and dream in color. Not only they can see well, but their hearing is also very good which helps them notice a threat before it is too late. We have discussed before about how chickens communicate. It is amazing how these gentle and simple creatures manage to communicate with each other. There are 30 distinctive sounds that a chicken can make in order to notify the flock of a threat, to teach young chicks (this is a hen`s job) etc. They also use body language for communication. However, it is a bit hard for a chicken that is introduced to a new flock to learn the way the new flock communicates but the new chicken will adapt fast. Chickens can show emotions. Mother hens get very emotionally connected to the chicks they raise and respond with empathy to their distress. Chickens are also known to make emotional connections with different species and can express emotions such as fear, anger, enthusiasm, friendship, boredom etc. Chickens remember their flock, their keeper, their keeper`s dog, events and their surroundings. Chickens also remember activities and toys that give them pleasure and are capable of seeking those things. They can remember an activity that got them rewarded and they will do it again without any problem in order to get rewarded again. A flock of chickens can show a highly organized social order. A pure example of how the chicken hierarchy works is the pecking order which every flock has. You might think that this is only the way of the domesticated chickens but in reality this kind of behavior is also shown in their jungle ancestors. What makes the social world of chickens even more amazing is the fact that they can coordinate for group activities such as playing, pecking or group defense. Chickens are highly aware of themselves and are constantly comparing themselves to other chickens. They can also recognize up to a 100 individual chickens from their flock by remembering their distinctive features such as looks and social status in the flock. I don’t even know how to show our readers how amazed I am by the problem solving capabilities chickens have. I can write many examples but instead of that I would highly recommend that you try one of these two DIY toys for your chickens and see for yourself how smart your chickens are. Previous Article How Not To Check Your Chicken Gender – 3 Worst Methods!!! Next Article How to Protect Your Chicken Coop From Flies!